Who hasn’t had a hard drive fail? I guess it isn’t really surprising when you have a device that stores your precious data on a metal platter (or platters) that spins around at 5400, 7200 or 10,000 rpm with a fraction of a millimetre precision. I still find it astounding how much stuff we can cram into such a small physical space… but I digress… The awe of digital storage pretty quickly yields to the rage that comes with losing data, especially when the realisation hits that I was too stupid or lazy to have a copy of it elsewhere. Those files, whatever they were – now lost for good. So after religiously backing up to CD, then DVD only to find the media hit and miss for recovery later, I decide that HDD redundant copies are the go. First, I dabbled with a RAID 1 setup then started to get paranoid about the controller. I just want to be able to recover the data, not necessarily rebuild the array.. What if I can’t read from the drives, where would I get another controller that was the same? 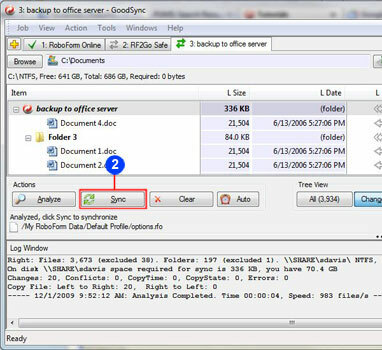 What if the problem was a deleted file that was deleted from both drives in the array? Too many questions, too much consideration and planning… I’m not worried about my O/S installation, if that drive gets pooched, I’ll just reinstall – by now, I have this down to a fine art and it takes but a couple of hours. So I resort to copying files to a backup drive, a simple external USB 2 drive and life was good I had copies at a certain point in time and would just add to it. Sure updated files would overwrite old ones but deleted files were still on the backup drive. But as the amount of data grew, so did the amount of time required to copy it and then to sort through it was a major PITA. There had to be a better way – and I found it. Enter Goodsync – note that there are many other brands of this type of program but Goodsync is the one that I found, trialled and went with. 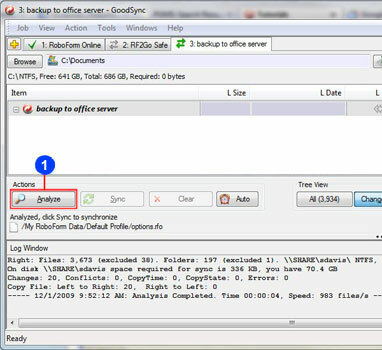 Goodsync copies files on a variety of triggers such as on boot, on logoff, on file change, scheduled time or even the detection of the backup media being connected. So now I can read the data on another PC without worrying about breaking an array or anything like that – just unplug the drive take it to another computer and “boom shanka” I’m in buisiness. The best part is that it also keeps copies of old versions and deleted files in a save folder, sure you have to go through and clean it out once the drive starts to fill up but I’ll take that as a trade off. The question I always come back to is this: Do I really need to store just about everything in 2 places? I snigger at those people on today tonight who live in houses so full of crap that they can’t walk around or can barely open the doors – hoarders! But if my PC was a house, would it be that much different? Next articleOptical Drives, who still uses them?